So I think that for calculation, there's still a pretty strong advantage for Silverlight, and my gut feel is that it's likely to stay that way. Both sides will continue to optimize, but there are some limits to what you can optimize in a dynamic language. I'd expect the CLR to be faster. I'd say that architecturally, it's a wash.
On the one hand Silverlight is MSIL code, which is reasonably fast compared to raw, optimized native code but still runs slower due to the VM (CLR) overhead and will still have slow initial load times when being ngen'd. At the end of the day when comparing apples to apples the real performance bottleneck is the DOM, and there it doesn't much matter what technology you're using to manipulate it. I don't understand why you're trying to compare a scripting language with a browser plug-in. They don't do the same thing. The former interacts with the DOM while the latter runs multimedia apps inside the browser. 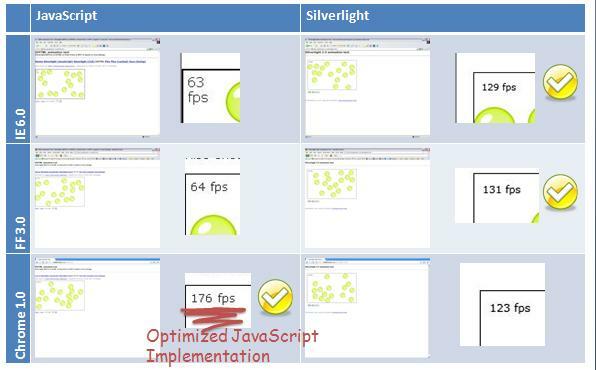 Comparing Flash and Silverlight from a performance point of view would seem more useful to me. 1) You will force your users to download a Silverlight app instead of relying on a relatively small .js file. 2) Your users are required to install Silverlight before using your page. Keep in mind, this is only on one machine, one os (XP) etc. you would need to do much more extensive tests to achieve more. On the performance question, you may want to have a look at Flash 10 which can allow c/c++ code using "Alchemy". This may be a more portable solution than SilverLight. Platforms should be considered here. How Silverlight performs in Lnux or Solaris or Mac is really big question ! If I have only the physical address of device buffer (PCIe), how can I map this buffer to user-space? If I have only the physical address of the memory buffer to which is mapped the device buffer via the PCI-Express BAR (Base Address Register), how can I map this buffer to user-space? 2409 MySQL max_allowed_packet param whats the catch? 5733 What is FLOP/s and is it a good measure of performance? How do I use IPython as my Emacs Python interpreter? How can I implement single sign on capability with Check_MK? How do I determine if an email is Base64 encoded? how do i use everyauth for simple (single step) authentication?